(SPOILERS) The elusive potential goldmine that is the video game adaptation. How many have been a success? Critically, next to none. Commercially, the Resident Evil series is about it. There are the precious few first instalments that instilled apathy (Tomb Raider, Mortal Kombat), but the odds are seriously against any lucky feeling studio making any serious dough. That may change (there are several interesting names attached to several interesting projects) but it wont be this year. 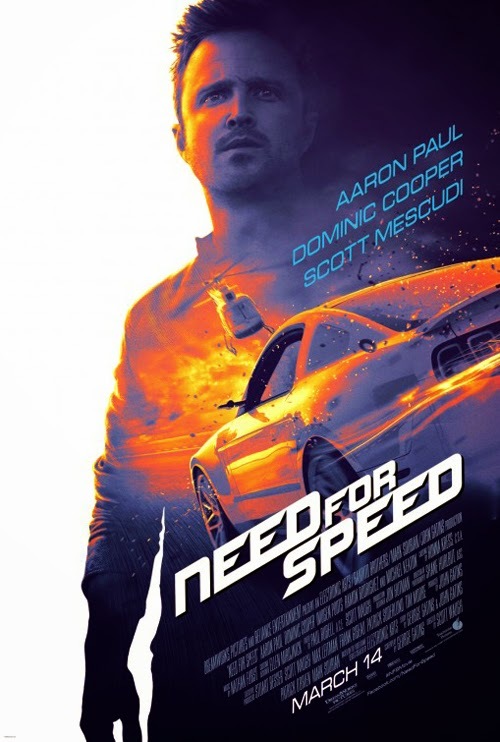 Need for Speed will probably make a profit when all’s told, but as an attempt to cash in on the success of the Fast & Furious franchise it fizzles, and as a prospective dumb-but-fun auto-racing movie it’s a dud. I think it’s probably fair to suggest that the only way to approach a big cross-country pursuit movie is not to treat it entirely seriously, particularly since the scenario where taking off as an act of rebellion against society and the squares while dogged by the fuzz has long since lacked resonance (like, since the ‘70s). Director Scott Waugh seems oblivious to this, treating the whole affair with a crippling lack of levity (and what there is, is painfully forced). A stunt co-ordinator turned director (his first was Act of Valor), Waugh knows where to put the camera (he’s especially fond of in-car shots –so you know the actors were really there!) but on this evidence he has problems editing his action together coherently. The results remind me of the choppy work that litters Simon West’s early career. Speaking of which, there are also attempts at Bruckheimer-esque rousing airborne panorama shots with that old favourite of the constantly moving camera; they’re passé though, aping older and better movies. The picture as a whole feels like everyone involved has been second-guessing, but that shouldn’t be a surprise given the abundance of missteps DreamWorks has made lately. Any given choice is likely to be a bad one, unless the ‘berg himself is involved. 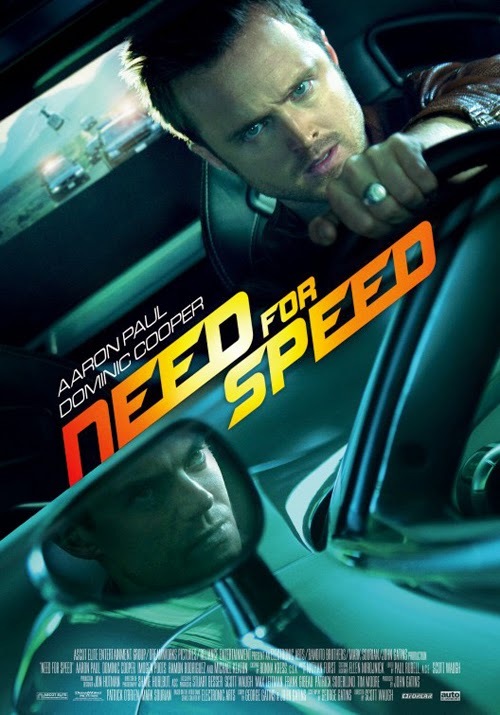 His involvement here extended to picking Aaron Paul for the plum role of Tobey Marshall, a former racer out for revenge after old rival Dino Brewster (Dominic Cooper, knowing that the only thing to do with a role like his is relish the irredeemable villainy) not only gets his pal killed in an impromptu road race but lies about it to boot. Two years later, out of jail and on parole, Marshall assembles his old crew of garage buddies with a revenge plan that entails getting picked for the De Leon, a race organised by racing buff Monarch (Michael Keaton); the winner takes the other competitors’ cars (not much point if they’ve all crashed en route, I’d have thought). This requires attracting the requisite attention (and thus an invite from Monarch) and reaching the venue in a madcap 48-hour drive from New York to California. Waugh’s decision to eschew CGI is admirable but, when a script is as wholly ludicrous as this one, attempts at realism are entirely misplaced. If you don’t play this knowingly, you look very silly and, with a grim-faced payback plot at the core, that’s exactly what Need for Speed quickly becomes. Instead of thriving on the clichés it exhumes, the movie is buried by them. There’s none of the infectious fun of the (best of the) Fast & Furious series, and the ensemble of Marshall’s helpers strain for absent chemistry and empty laughs (Harrison Gilbertson, Scott Mescudi, Ramon Rodriguez and an especially irritating Rami Malek; he wants to be exuberant and cheeky but is just loud and annoying). There are attempts to circumnavigate the gross irresponsibility of these young hoodlums and then their petrol head antics – Mescudi provides an air spotting service to ensure members of the public don’t get run over – but it’s impossible to ignore the fact that pretty much everything that happens is a result of Tobey’s brashness and rashness. Yeah, Dino is a massive wanker, but Tobey continually rises to the bait. He gets involved in a business deal to rebuild a Ford Shelby Mustang when his chums warn him against it. And then, when he has his profit in the bag (assuming Dino doesn’t stiff him), he childishly risks everything to massage his ego and jumps into a race that results in one of his friends getting killed. Later he unveils his plan to get even, but it’s unfathomable quite how he expects this to play out since everything that happens is either the result of Julia (Imogen Poots) rallying to his side or the result of enormously lucky coincidences (one of the cast even has to ask “Why wouldn’t he destroy it?” of the car Dino used to ram Tobey’s pal off the road; it’s the old “trick” of, if you’ve got a really, really, stupid plot development in store, draw attention to it in the hope audiences will just accept what’s in full view). Then, instead of having a sensibly recuperative night-in pre-race, and having antagonised Dino whom he knows is a psycho, Tobey goes out for a drive and acts surprised when someone puts him in a car wreck. This might be less of a problem if Paul exuded anything but dead-eyed intensity. Spielberg liked him, as does everyone, for Breaking Bad, but on the evidence of this he doesn’t have what it takes as a leading man (which is fine, a good supporting actor often gets better parts). The danger is, Paul might end up being seen as one-trick pony. Can he play other types? Stony severity isn’t the boost this movie needed, and it’s left to both the Brits to take the acting honours. It’s the only memorable line here, with one caveat. The chases don’t linger in the mind either. There needed to be a Roscoe P Coltrane type in hot pur-suit of Tobey, rather than Waugh wasting time (this film is drastically over-long) on him driving the wrong way up streets or – almost, only almost, likeably stupid, since the amount of effort involved would have made it much quicker to stop for a couple of minutes – refuelling in transit. Nothing here is cool, and nor are any of the sequences suitably adrenalising. To misquote the estimable Point Break, Need is young, dumb, and... really dumb. Even with all the havoc and mayhem caused, all the lives endangered, and the ruination of homeless folks’ shopping trolleys, Tobey is such a wonderful chap that he saves Dino at a crucial moment. The problem isn’t that; it’s that there’s no spirit here, no joie de vivre. Tobey isn’t about a need for freedom and expressing his individuality; he’s all unrefined rictus rancor. The races themselves – topping and tailing the movie - have little sense of route, geography or opponents (aside from Dino); the kind of fundamentals required to make such automotive antics engaging. Waugh must take the co-blame as co-editor. The cinematography is bold and bright, but wasted amid the general incoherence. The soundtrack is just a loud mess, which matches the general tone. The screenplay, credited to George Gatins, is telling his first (brother John gets a story credit; his past efforts include the poxy Real Steel and half decent Flight). The caveat I mentioned earlier relates to Keaton, who is an incongruous kind of car enthusiast, but whose improv (“Racers should race, cops should eat donuts”) gives the picture a turbo charge whenever he appears – even if it’s just by way of voiceover. Keaton’s profile has lifted recently, which is long overdue. On this evidence (he’s also one of the better things in the Robocop remake) he’s in fine shape and of suitably quick mind should Beetlejuice 2 ever get off the ground.